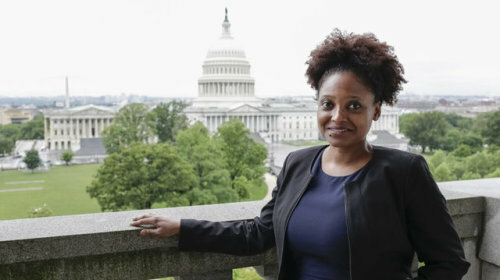 Tracy K. Smith is the perfect choice for U.S. Poet Laureate, and here's why. Librarian of Congress Carla Hayden recently named Tracy K. Smith as the next United States Poet Laureate, and this selection could not be more timely. The Poet Laureate position grants the selected poet a $35,000 stipend and asks for only a few official duties. It was created in order spread awareness of and appreciation for poetry across the nation; how exactly the selected poet does so is up to her. For example, previous poet laureate Billy Collins started the Poetry 180 Project, in which he collected 180 poems for high school teachers to share with their students every day of the school year. Smith has an interest in making poetry more accessible to everyone in the country and has expressed a desire to go to rural areas to talk about poetry. Hayden said she got excited about this goal of hers since that is the reason the library exists and yet somehow the thing they need to improve upon. Smith would be the first laureate appointed under Trump’s presidency, so her selection was an important one. The position requires no political involvement, and thus she is given free reign to mend wounds instead of trying to make a statement. By engaging the whole country in poetry and building an enthusiasm for it, she hopes to heal divisions and inspire empathy more than anything. This collective excitement for poetic dialogue might be the perfect solution to the partition in the country. While any poet can engage an audience and strive to revive the passion for it, Smith’s style of writing is what makes her stand out in accomplishing this task. Somehow the lines grasp at something, dark, empty, worrisome, but also a shift of hope at the very end. Smith is known for incorporation of sci-fi and space, which may seem random, but actually, allows her to convey current anxieties and fears through exaggerated yet familiar dystopian images. It also helps widen the view of her poems to something more existential, which are the kinds of questions she has – like about religion and nationalism – and that she does not have answers to. Though her strategies might all sound complex, they’re really not. Sci-fi kitsch, the items you see at a house party, and roast chicken dinner are all familiar images for us. She just uses these grounded elements to express something bigger. This is especially important now as we live in an anxious time. No matter what “side” you stand on in America, you have a specific dread about the future and what the world is turning into based off the media we consume or just the tenseness you feel walking outside. Smith relates to this worry and empty-stomach feeling by evoking that absurd dystopian dread. But she simultaneously silences that dread by letting it be okay to have questions. There is a comfort of not knowing what’s next when things go wrong, and we may actually find beauty in it. And if we can get the world to appreciate this collective discomfort, maybe it’ll lead to mobilization. Maybe by evoking fear through the same images we’re all familiar with, we can connect to each other, find humanity amongst our differences. This, to me, is what Smith’s poetry evokes, and I hope she takes those sentiments and turns them into a national movement. But until the fall, I’ll keep reading her poetry in anticipation. I used to love Archie, but now, thanks to Riverdale, I can't even look at him. What's the best - and worst - advice you've gotten about procrasturbating? What if I told you that meme you’re laughing at is saving the world as we know it?